Bosch and Samsung dishwashers are the best selling appliances in the US market. While their pedigree might be widely different, they still carry some similar traits that make them favorites among consumers. Bosch dishwashers are recognized to be the best in the world. But while Samsung is relatively new to the appliance marketplace, it is an unfailingly cutting-edge company that’s always at the forefront of technological advancement. 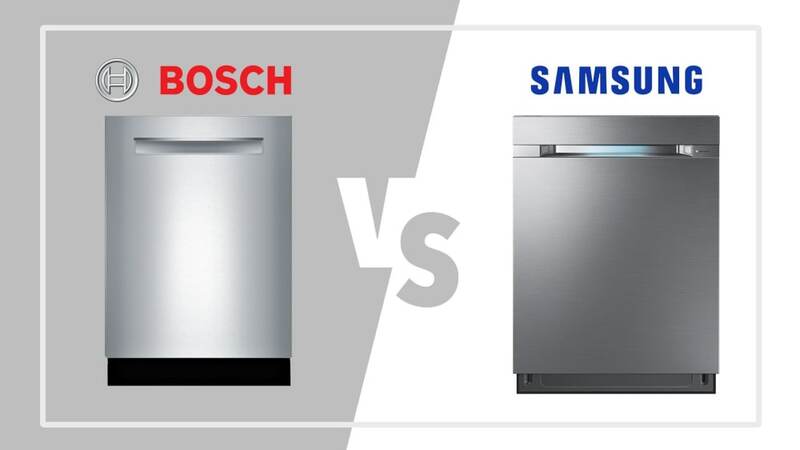 In this review we’ll take a look at Bosch vs. Samsung dishwashers while comparing their most significant offerings. This way, when it comes time to make a buying decision, you’ll be informed about just what makes these two brands of dishwashers different, what makes them the same, and elements of their greatness. So, let’s check out the most important features of a dishwasher and how each company fares. The good news is that both Bosch and Samsung offer impressively quiet dishwashers. Bosch is well-known for their quiet dishwashers, which offer a noise range from 38 to 50 dBA. Samsung offers a similar range, from 38 to 55 dBA. Considering that 40 dBA is about the volume of a library and 50 dBA is about the volume of a quiet conversation at home, those aren’t bad figures. The success on impressive quietness on both manufacturers can be attributed to their focus on proper insulation as well as the wash techniques they use that promote nearly silent operation. Low-end Samsung models have a price point under $500. However, due to their noise levels at 55 dBA and unimpressive set of features we decided to not to include them in our review. Both Bosch and Samsung offer sleek designs for contemporary kitchens. Bosch has been in the market a long time, but they’re still quick to adapt to design and interior decorating trends. Meanwhile, Samsung dominates all over the house from cell phones and televisions to everything in-between. Their dishwashers are no different and Samsung dishwashers are designed with a modern customer in mind. Bosch makes well over 100 different dishwasher models. Bosch dishwasher catalog is grouped based on functionality and upgrade features - The Ascenta/100 Series as entry level, 300 Series where Bosch technology becomes evident, 500 Series with the introduction of the most popular pocket handle design, 800 Series with luxury and high performance and Bosch Benchmark Series for ultra-luxury. Bosch makes special application ADA units for kitchens with raised floors, 18" models for small apartments and panel-ready units for those who want to create seamless kitchens with wood cabinet finishes all around. In turn, Samsung makes total of 18 dishwashers including color combinations. Among these models black stainless colors are the most recent customer favorites. First, let’s look at the truly important features of Bosch and Samsung dishwashers — their cleaning and drying ability. As an additional resouce please check out our in-depth reviews on Bosch and Samsung. One thing both of these companies have in common is that they tend to keep it simple when it comes to programs and options. After all, surveys show that most families use one or two favorite cycles on a daily basis. Both Bosch and Samsung dishwashers only offer up to 7 cycles and 7 options even on their most advanced units. These include express, sanitize, pots & pans and intensive wash cycles in most of their product lineups. Remember your mom's old dishwasher with yellowing interior? Once you cross the $500 threshold in dishwasher price points, you will not have to endure that awful sight. Fortunately, Samsung and Bosch both offer predominantly stainless steel interior tubs. Mind you that stainless steel interior tubs are not just visually pleasing on dishwashers — they are an integral part of the drying system. We must note that Bosch Ascenta and 100 Series dishwashers feature stainless steel interior walls but with a gray plastic bottom. This is to keep the price points of Ascenta and 100 Series dishwashers on or around $500 to be able to compete with inferior yet inexpensive competition from core brands such as GE, Whirlpool and Frigidaire. Here is where the two companies part ways. Bosch offers condensation drying, which is the most advanced and energy efficient drying technique. Most dishwashers in North America use heating elements — giant metal pieces that heat up to 170 F or higher to dry dishes. While this brute-force technique dries dishes (how can it not in an enclosed space...) it has 3 important drawbacks. With condensation drying, moisture is absorbed by the stainless steel walls and then washed away. In 2018, Bosch took this technology a step further by pumping extra heat into the dishwasher cavity via a heated water rinse at the end of the wash cycle which helps coat dishes with a thin hot water film which gets eventually absorbed the the stainless steel walls. This important feature upgrade helped Bosch eliminate most of their negative feedback with regards to drying. Samsung also uses condensation drying in their dishwashers. Although their heated drying technology is not as advanced as that of Bosch, they make up for it with their AutoRelease doors on the more expensive models. Buyers in areas with hard water, such as Northern New Jersey, will be pleased to hear that Bosch offers dishwasher models with a built-in water softener to help combat calcium residue. This feature will get you crystal clear results without the spots on your glassware. Bosch offers models with water softeners in select 800 Series and Benchmark models. Special application 300 models such as the ADA-height units also offer water softeners. Samsung does not offer water softener models at this time. 3rd Rack for silverware has been a great space saver in dishwashers. This feature allows you to have more space for plates, pots and pans in the low rack without the need for a cutlery basket. Bosch dishwashers offer three different types of 3rd rack designs. Lower-end models come with standard 3rd rack which is great for flatware. It’s unique "V" shape leaves room underneath on each side of the middle rack for taller items like stemware. The flexible 3rd rack which features wings that easily lower with a touch of a release button to accommodate more of your deeper items. The MyWay™ Rack is an exclusive feature reserved for luxurious Benchmark and Series dishwashers. MyWay™ rack is the only 3rd rack with space for cereal bowls. You may visit our article for additional information about Bosch's MyWay™ rack feature. Samsung's DW80K7050 offers a standard 3rd Rack for silverware and utensils. High-end Samsung models such as the DW80M9960 have removable 3rd Rack with Flextray™ feature. As shown below in the picture this is a time-saving approach which becomes handy especially when unloading silverware and utensils. Both Samsung and Bosch have you covered, with dishwashers designed to detect leaks and instantly shut off the water source. Basically, the sensors at the basin of the dishwasher are able to detect moisture. Bosch offers even more advanced leak protection than Samsung, with water sensing and instant shutoff even attached to their hoses. This is an unparalleled feature in the dishwasher market shared by only another German brand Miele. Therefore, Bosch dishwasher will come with their own hoses attached whereas this is an extra add-on part that needs to be purchased separately with other brands. Samsung's marketing jargon might get confusing at times. Since the terms "StormWash" and "WaterWall" frequently appear on nationwide marketing campaigns we figured we should quickly explain what they mean. WaterWall Explained: Almost all dishwashers use a rotary sprayarm to distribute water. High-end Samsung dishwashers are equipped to spray water similar to a wall from one end of the tub to the other without missing a spot. StormWash Explained: Lower-end Samsung dishwashers do not have the WaterWall technology and use regular rotary sprayarms. However, Samsung improved on this feature with an addition of a special nozzle (red & circular nozzle) on the lower left corner. Just activate the StormWash program to go after the dishware that needs it the most. Bosch has a great reputation when it comes to durability and longevity. Bosch dishwashers are tested to withstand a minimum of ten years of use. Moreover, great service has long been a hallmark of the brand. After a few false starts during 2009-2014 period Samsung has come a long way in terms of dishwashers quality. As we touched upon on the design section above Bosch provides us with different series of dishwashers with a step-up ladder in features and pricing. As Bosch makes more than 100 dishwashers you are most likely to find one that meets your budget goals. Bosch Ascenta and 100 Series dishwashers generally cost somewhere in the $500 range. Moving up the product line, the 300 and 500 series options possess features that are sought after by most modern costumers. They’re also generally available at a price point below $800. Bosch also runs many promotions during the year to help accelerate sales of these models. The most popular pocket handle Bosch 500 Series Dishwasher SHP865WD5N is listed at $849 but during promotional times you might be able to save +/- $100, and even more as part of a Bosch kitchen appliance package. Once you hit Bosch’s flagship 800 Series, you’ll begin to notice advanced features and visible quality enhancements. These include better racking setups, a flexible interior, and insanely quiet operation. You’ll also quickly notice a higher price tag to go along with all these advanced features. The luxurious Bosch Benchmark series dishwashers have a price range from $1,099 to $2,099. However, Bosch runs even more generous promotions with the Benchmark line. Samsung offers only 18 dishwashers with prices ranging from $400 to $999. The DW80K5050US and DW80K7050US are two related models in the $500 and $600 price range. Above this level, you’ll find the DW80M9550US and DW80M9960US. These models offer incredibly quiet operation at 42 dBA, plus all of the trademark Samsung features. Prices range in the $800-$1,000 neighborhood. If you’re looking for a high-end machine that hasn’t lost sight of the main function of a dishwasher, both Bosch and Samsung will have you covered. Bosch brings a decades-old lineage of high quality dishwashers to your kitchen, but Samsung brings high-tech experience and a cutting-edge approach that’s sure to delight you as well.